I have a pair of ACR Khorn clones which were originally equipped with a rather simple xover. I now bought a pair of B&K Sound xovers which can be simply rewired from AA to A circuit. Is there any helpful guy out there who can explain to me the difference between A and AA xovers ? The AA network is identical to the A except the AA has a 3rd order tweeter filter and the A has 1st order. The AA offers more protection from blown tweeters but the filter is lossey and has a rough response. The A can't be run at high levels becuase of danger to the tweeter but has a smoother response. Just curious, what's the crossover point for the K77 on the A network? Now having substituted the original ACR xover (which featured no filter for LF and some simple 1st order for MF and HF) the B&K in the AA mode sounds nice on LF and offers some more detail on MF but blows my ears on HF. Maybe I have to add some resistor on the tweeter to reduce power. If I remember correctly, there were some xovers with just built-in resistors to adjust HF. I am at a bit of a loss here becasue I don't know what an "ACR" crossover is! Anyhow, the 1st order filter in the tweeter is so sloppy that low frequency energy is getting around the filter is large quantity. It is also not possible to pin down what the crossover is, as Dean suggested. This is usually more than a K77 tweeter can handle except at very low volume levels. Cutting the tweeter down with an L-Pad helps some. If it sounds like it's to hot then all the better to attenuate it. I'm curious as to what db levels tends to blow the tweeter on an 'A'? I've yet to hear anyone blowing a tweeter with this crossover and I wonder if an A would be better for me. I wonder if the risk with an A is over-exaggerated? 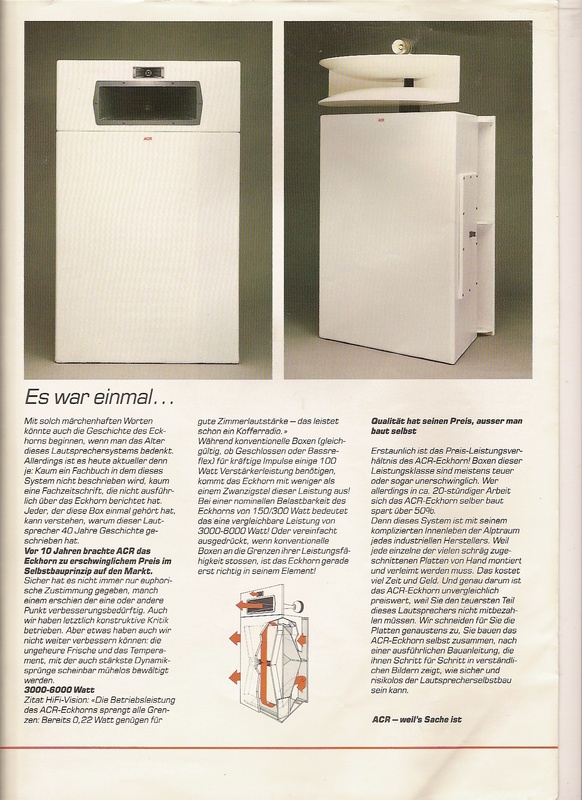 According to PWK the Klipschorn is rated for 100 watts continuous. With 104 dB efficiency speaker, that's pretty dern loud. When high power solid state amps appeared in the early '70's, Klipsch started getting lots of replacement requests for the K-77, so he began using the AA. If you believe even half the posts by high power amp users and the volumes at which many of them claim to listen, or the statements of many here of blowing tweeters themselves, the possibility of blowing a tweeter may not be that exaggerated. Not only are tweeters endangered by high powered amps, but they're in even more danger of being blown by lesser powered amps that are driven into clipping. Blowing tweeters can be done; it takes a fair amount of concentrated recklessness or carelessness, though. Blowing out the tweeter with a 1st order netwrok is only the extreme consiquence of high levels. The first thing that happens is that the tweeter starts seeing lows that it can't handle. That causes distortion in the form of buzzing. It's only after long time absue that heat finally takes out the voice coil. BTW: There's no way a tweeter will take 100W of power! That rating is only for the woofer. That is where the power lies in music. The K77 tweeter can only take about 5W or so. I built a few sets of these ACR clones during the late 80's while I was in the service assigned to germany. The ACR clone was called an ECKHORN. It uses a PA-38 public address high out put full range driver in the bass bin. I still have a set of PA-38's that some day will get installed.The factory models were MDF. many hui-fi shops that sold the parts and speaker line recommended high grade plywood...which is what I used. There were various mid's and high range drivers for these. some had wooden horns, others had the casted metal horns. the cossover was intended to perform much like a model A xover. the ACR ECKHORN uses as many as 4 zener diodes in the tweeter protection circut in stead of the two used in the AA network. The factroy xover networks were ahead of it's time using high voltage metal film capacitors and large guage air core inductors (hangar wire size). I still have the plans and schmatics on paper copy, as well as some of the sales brochures for the acr ECHORN and the complete driver catolog for that era. The ACR dealers in europe really know their stuff and their product line is truely amazing. Well, sounds good now ! I don't know if the risk is over-exaggerated, but I have been using a type A off and on for three years and never blown a tweeter. I currently am using a type A with a 4500hz mod to cross the K-55 to a CT-125 tweeter. This tweeter is near bullet proof compared to the K77. My Khorns have never sounded better, to my ears. I currently am using a type A with a 4500hz mod to a CT-125 tweeter. This tweeter is near bullet proof compared to the K77. My Khorns have never sounded better, to my ears. It's UNDERpowered amps and clipping distortion that blows those K77's. Hooking up a 250 watt channel amp to any Heritage is probably okay. Wiring up a 25 watt receiver and cranking up the distortion will cook any driver. Does that mean the tweeter section with an A would be less painful? I like to keep You all informed about my last mods I put in place. After the BK Sound xovers I installed 2 Fostex T 925 A tweeters with Fostex L-Pads and I have to state that the Fostex are light-years ahead of the T 35. Next step will be to test a pair of Jabo Tractrix squawkers which are originally equipped with 2" drivers but I think to put Eminence 1" drivers in place with an adapter. Now with a good sound, I discovered also that 95% of my CDs are really awfully mixed; seems that all sound engineers mix only for cityblasters .... Do You have made the same experience ? If the attachment uploaded...here is a photo of stock ACR EckHorn. I built a set in 86. Started out with the flat panel top section, later moved to the wide wooden horn.